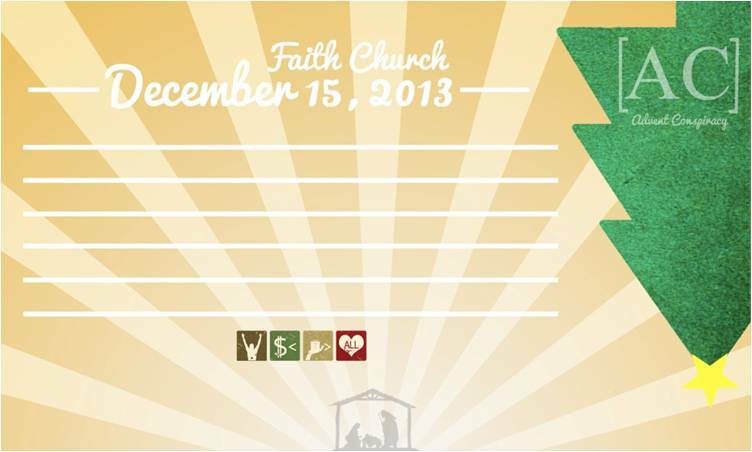 This past Sunday the theme was Give More, and AC suggests that, instead of giving presents, we should give presence. Give the gift of spending time building relationships with people. This idea flows from the example of our Lord who gave us the gift of himself. In John 1 we learn that “the Word became flesh and dwelt among us.” In Philippians 2:5-11 we read, similarly, that Jesus emptied himself, being made in human likeness. He gave us the gift of his presence! One of his names is Emmanuel, meaning “God with us.” We talked about how to give the gift of presence. So at sermon roundtable, one of our people had the brilliant idea of creating a coupon exchange where we give gifts like “1 hour of babysitting” or “teach you to make a pie”, etc. We handed our blank coupons, and asked people to write their gift and name on the coupon, then come forward and hang it on a Christmas tree. When they hung a coupon, they could take a coupon. What give did you receive? How can you give the gift of presence to your family and friends this Christmas? Maybe you can give more coupons!